Ely Cathedral dates as far back as the seventh century, though the present building is Norman in origin and was completed in 1083. Age isn’t the only amazing feature the church boasts: Architecturally, its crown jewel is the central octagonal tower known, perhaps unoriginally, as the Octagon. This wild game of "football" between two sections of an English town has been staged every year for countless centuries. The gorgeous tower was actually born from tragedy rather than practicality. The Octagon, with its enormous internal open space and very unusual wooden “lantern” above it, came about after a 14th-century disaster. On the night of the February 12, 1322—possibly as a result of digging foundations for the nearby Lady Chapel—the central crossing tower collapsed. Instead of being simply restored to its original size and shape, the space at the center of the cathedral was enlarged to form an octagon far larger than the square base of the first tower. The resulting octagonal stone tower has eight internal arches and supports an amazing timber fan-vaulted roof. 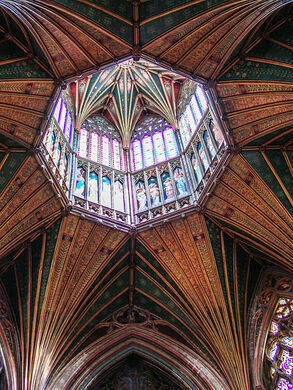 The roof, and the lantern which seems to sit precariously upon it, are actually held up by a very complex wooden structure above the vaulting. Some say this structure couldn’t be built in this way today because there are no trees big enough. The central lantern, also octagonal in form but with corners offset from those of the tower, rises above the church’s roof like a crown. Its interior has panels displaying painted images of musical angels. 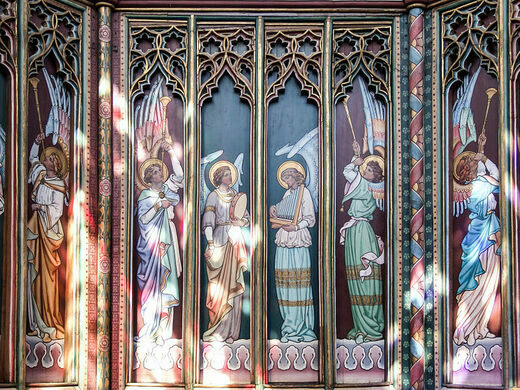 Sunlight spilling in through the windows reveals their vibrant colors and intricate artwork. 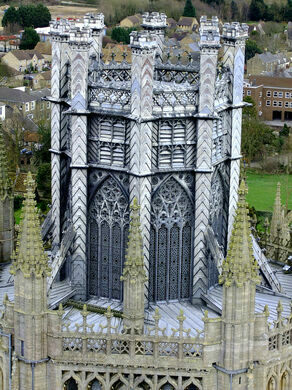 The panels can be opened and accessed from the Octagon’s roof, allowing choristers to sing from this great elevation.